Self-pollination (facultative or obligatory) is known or suspected for a rather small number of Gesneriaceae (e.g., species of Epithema, Rhynchoglossum, Monophyllaea). Their flowers are mostly small and inconspicuous, often produced in large numbers, and fruit set is almost 100%. Unlike many other members of the family, there is no flower-development strategy that prevents or discourages self-pollination (e.g. male and female parts develop at separate times). In a few cases the flowers do not open at all and fertilization is within the flower bud (e.g., Streptocarpus nobilis, Codonanthopsis dissimulata). Such “cleistogamous” self-pollination, when it occurs, is generally combined with some instances of “normal” flowers subject to cross-pollination. 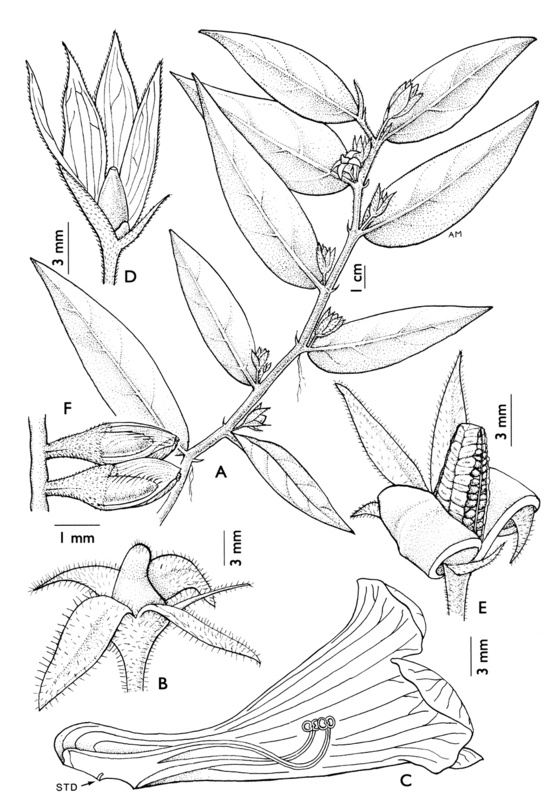 Codonanthopsis dissimulata produces significant numbers of cleistogamous flowers (B), that never open but self-pollinate and produce seed exposed in a display fruit (E). Normal (chasmogamous) flowers (C) are also present. From Codonanthopsis dissimulata (H.E. Moore) Wiehler in Selbyana 5: 61 (1978) sec. Feuillet and Jansen-Jacobs (2008).